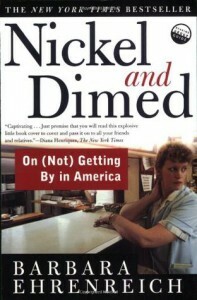 If you have ever worked in the food, retail or any other service requiring physical labor for low pay, had to live from paycheck to paycheck or worse, there is no reason to read this book. Having lived on that side most of my life, and still some what do, I found the book to be whinny, repetative and not too informative (the statistics were added as footnotes). I skimmed/skipped through the last chapter and hope to abandon the book on my next train ride or else donate it to the Goodwill, for irony's sake.